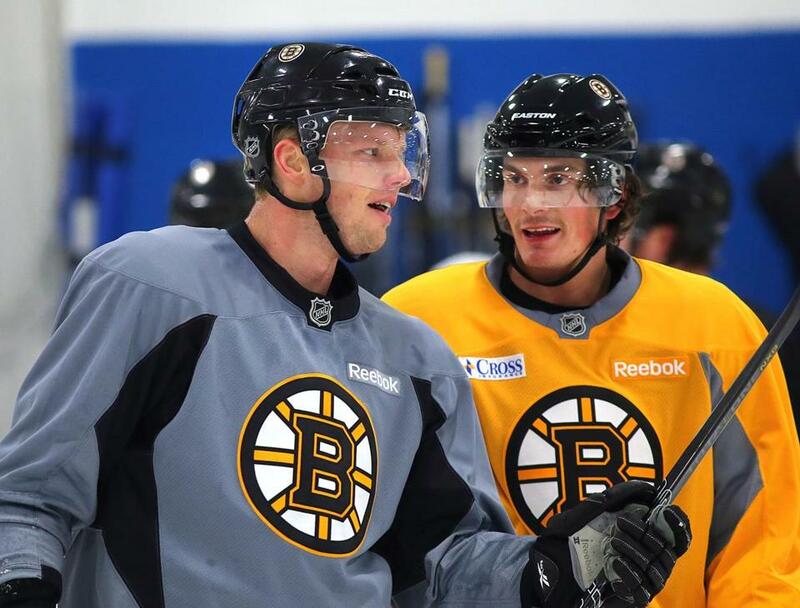 Carl Soderberg (left) is happy to have countryman Loui Ericksson around when a word in Swedish is needed. The check-ins came each year, the hope waning a bit each time. Sometimes Peter Chiarelli would talk to Carl Soderberg himself, sometimes to his agent. The message seemed, generally, to be the same each time: Soderberg loved hockey, wanted to play in the NHL. But not yet. That “not yet” stretched and stretched and stretched some more, the years passing, the player — and the Swede’s return to the United States — becoming a running joke between the Bruins general manager and members of the media. It had, after all, been six years. When was anyone going to see the Malmo mystery man? It had started the way trades often do — as Chiarelli said, “a broken toy for a broken toy” — when the Bruins picked up Soderberg, a former second-round draft pick, from the St. Louis Blues for goalie Hannu Toivonen in July of 2007. Soderberg was “big and strong and skilled” at a time when the Bruins were looking to get bigger and stronger. It wasn’t until last spring, when Chiarelli picked Soderberg up at the airport in Boston that the Bruins saw their long-ago investment outside of Sweden. And it wasn’t until this past month that the Bruins finally saw a return on that investment, as Soderberg has become a key component of a revamped third line along with Reilly Smith and Chris Kelly. The reasons for that delay have their beginnings in that year before the Bruins acquired Soderberg, in a difficult adjustment to the United States as a 20-year-old, in a severe eye injury sustained the spring before the trade, and in a player whose mental readiness and physical readiness for the NHL took years to align. When Soderberg arrived in the United States, he didn’t talk much. He doesn’t talk much now, either. But then it was worse, the unhappiness drawing him away from teammates and potential friends, feeding his reservations. He hadn’t listened to himself, hadn’t trusted his instincts, as the voices of others crowded out everything he knew he wanted. So there he was, 4,547 miles from his home in Malmo, silent and suffering. It was September of 2006, he was 20, and training camps had just opened across the NHL. Soderberg had come to join the Blues, having been drafted two years prior. It was time to start his North American hockey career. But, he said, his heart wasn’t in it. “I was too young,” Soderberg said this week. “I wasn’t ready for it at that point. I should wait maybe one, two years more. The days were a slog of hockey and homesickness, the desire to be back in Sweden a constant tug. He didn’t last long. When the Blues attempted to assign him to their American Hockey League affiliate, he bolted back to Malmo. Soderberg says now that he wouldn’t have stayed, no matter what. He says that he was so unhappy, so mentally unprepared, that even the prospect of playing for the Blues wouldn’t have kept him here, though that doesn’t exactly match up with reports at the time. “I was by myself a lot,” he said. “That was a mistake. I should have tried to give it a shot, hang out with the guys. But if you don’t want something, sometimes you don’t try. That future, though, was nearly wiped away. Soderberg had returned to Malmo and the Redhawks, after his failed bid in the US. He was playing some of the best hockey of his career, albeit in the Swedish second division, the Allsvenskan League, with 30 points in 31 games in 2006-07. Then he took a high stick to the left eye, suffering a detached retina. Soderberg was left, officially, with 20/80 vision in his left eye. But asked how his sight is, he says, “Actually, I don’t see much at all.” He has described his sight out of the eye to teammates as only shadows. So could Chiarelli, who had experience with a player with a detached retina, like the one Soderberg had suffered and described this week as “dead.” Dany Heatley twice had scored more than 50 goals for Chiarelli’s Ottawa Senators. It took the better part of a year for Soderberg to return to the ice, and multiple seasons after that to regain his game and his strength, after coming back out of shape and out of practice, but he adapted to his new reality. With his sight greatly diminished in the eye, he had to figure out ways to compensate, further delaying his readiness to play in the NHL. But he worked and he developed and, as he did, he noticed things he didn’t notice before. He appreciates the efforts of his linemates to be more vocal on the ice, something he’s found is much more prevalent in the North American game than it was in Sweden, where on-ice communication is rare. Still, it wasn’t something he told his Bruins teammates immediately. Smith said it took weeks to learn about his left wing’s eyesight. Since learning, Smith has made a few adjustments. When Soderberg gets stuck on Smith’s side of the ice, the right wing tries to relieve him as quickly as possible, knowing Soderberg is lost there. Because while he could play either center or left wing – he is a natural center – the injury has left Soderberg unable to play on the right side. “If you watch him sometimes take pucks on his left, he bobbles them more than he does on his right because of his left eye,” Chiarelli said. “But not very often. It is now more than seven years after Soderberg first came to the US, more than six after the Bruins got his rights, and his career is just now beginning in the NHL at 28 years old. He is still quiet, still keeps to himself, still talks in a whisper, as Smith put it recently. But he is making an effort, trying to engage with his teammates of late, especially his linemates. He acknowledges that while his English is good, he isn’t a native speaker and that hampers him, even in a dressing room with other non-native speakers. Loui Eriksson has helped; a word in Swedish when needed is a comfort. So too is the fact that Soderberg now wants to be here, unlike that long-ago training camp. He no longer feels out of place, no longer like a rookie. He is more secure every day – in his English, in his place in the NHL, in his decisions seven years ago. So, even as he starts over at 28, Soderberg isn’t worried about what he’s missed. He appreciated his time at home, in Malmo. He appreciated taking the slow road, developing at his pace, making sure he was ready. And now, here he is, finally in Boston.